Piko Piko is a platform game about girls with hammers. Piko lives in a peaceful world, but all changes when strange shakes start to happening. After the school got destoyed, Piko is the last blacksmith girl, now she have to find and beat the Seniors to become a true Blacksmith. Then, Piko embarks on an adventure with illegal technology, government control and silly anime style jokes. 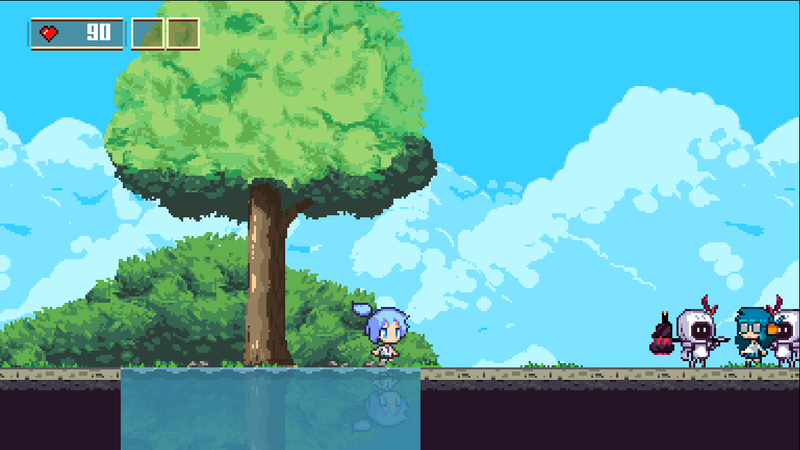 Piko Piko is a anime style/adventure platform action game with some visual novel elements where you play as Piko, a little blacksmith girl with a big heart hammer. Hi, I've a problem with the linux version, I can't found the run file, can u please tell me what is? This is a very adorable game! But Piko flies up to the sky at here when I perform the hammer slam :( , also there isn't a save system as far as I see (Data and Status Menu isn't working). I am in love with this game! It's so cute, the prettiest game I have seen on itch.io! Hope to see more in future! I love this game! Can't wait to see what happens next!! I thought this game was great and loved the combat mechanics and pixle art style. I can't wait for it to be fully released! Hey there, I tried opening the rar (windows) but my zip program doesn't seem to agree that this is a rar file and can't do anything bout it. I can open other rar files here, so maybe the file is corrupted on last update? This game is crazy. But it's a good crazy! The way the narrative hops along from one random scenario to another is quite something to behold, and all the while smashing things with a hammer with some pretty nifty platform elements kicking around too. While it's far from perfect at the moment, with some love, care and a dash more insanity this game can be something amazing! Loved the demo, can't wait for more! So the end of the game is getting stuck outside your house between a locked house, a rock fall and a door without a switch? Pretty solid game but we did notice some spelling errors like “bleading” instead of “bleeding” and some “I”s that were lower case. Also a tiny glitch in the beginning with the hit boxes causing Piko to hit nothing in the air during the down jump move and getting stuck for a bit. I have trouble jumping over an enemy and than pressing attack and down, it always results in me just falling to the ground without doing anything. While a little rough around the edges in its demo stage, Piko Piko is a nice combination of cutsie anime style and giant hammer based violence. The variety of unique characters help to give the world that extra bit of life, but don't overshadow Piko herself, with her big red hair. I feel the controls could use some work, as I had some difficulty surviving what I assume were boss fights, but the gameplay still had a nice feel to it overall. This has potential to be something really good, so I wish you good luck. And good job on what you've done so far. I thought the game was very good. reminded me of Cave Story in the way it feels and the music. the only thing i didn't like was the controls for the hammer ground pound. It was confusing at first if i would jump then press down but eventually figured out you have to hold jump and down at the same time in the air which take some getting used to. I would switch it to just press down in the air to ground pound but that's just my opinion. aside from that and the game being in alpha i think its coming along very well! love this game please continue to make it! Was pretty fun, but I found a crazy bug in the boss fight, haha! Also not sure if it was my controller, but trying to do the downward smash was really inconsistent for me. Love the direction it's going in, though. Great visuals. Very Cute! Got stuck though. Not this bug again... TT i have already fixed this, but looks like it's not fixed. Thanks for the insight. Super Kawaii platformer! An anime girl with a gigantic hammer how could you go wrong? Controls take a bit to get used to but, once you get the hang of it starts to get easier! This looks awesome and I would love to see it finished! I think I found a glitch with the bouncy red thing though , it bounced me way too high and now I'm stuck outside the screen and I have no way to get back down. Huh, with the way the combo attack is a drill and attacking in the air turns it into some kind of heart cannon, this hammer doesn't feel very much like a hammer. It doesnt sound like there's a whole lot of weight to the attack, though I can understand that an early demo will not have much refinement in the sound department. The gameplay is fun, though. Just not exactly what I would expect when the "Hammers" are listed as a feature. In the full game, are there more hammers to wield? Can the hammer be upgraded? Had a good time playing this one. Great graphics and nice gameplay. I did go to -200 health though. Yeah i forgot to disable the Dev immortality code. Already fixed this and others minors bugs. Thanks i'm working right now to find this bug. Well, it doesn't happen EVERY time I get hurt, but usually it'll happen when I'm trying to do an air attack (smashing them on the head, or shooting them) and then I'll collide with the enemy. I'll get knocked back and then Piko will freeze. After that it won't let me move out of her knock-back state. I'll play the game again (Cuz it's fun anyways ;) ) and see if I can give you any more details!